BISHKEK, March 28. /TASS/. The presence of the Russian military in Kyrgyzstan makes a considerable contribution to strengthening the republic’s defense capability and ensuring security in Central Asia, Russian President Vladimir Putin said after negotiations with his Kyrgyz counterpart Sooronbay Jeenbekov in Bishkek on Thursday. "The Russian military base in Kyrgyzstan makes a considerable contribution to strengthening the republic’s defense capability and its presence is an important factor of security and stability in Central Asia," Putin stressed. Russia and Kyrgyzstan have agreed to strengthen cooperation in the military and military-technical spheres, the Russian president said. 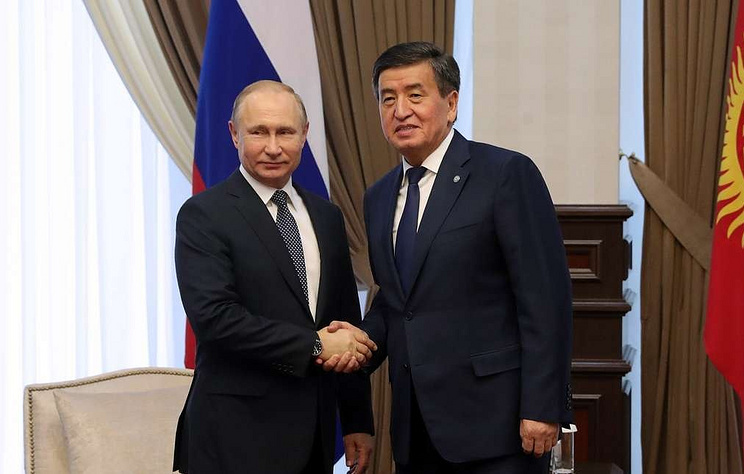 At their negotiations in Bishkek, the Russian and Kyrgyz sides also noted that they had identical or similar positions on key regional problems, Putin added. "We agreed, in particular, to further coordinate work in the UN and at other leading international venues," the Russian president said. This year, Kyrgyzstan simultaneously chairs the Shanghai Cooperation Organization (SCO) and the Collective Security Treaty Organization (CSTO), Putin noted. "We will be glad to come to Bishkek and take part in the SCO and CSTO summits that will be held in the Kyrgyz capital in June and November, correspondingly. We expect together with the partners in these organizations to discuss in detail the issues of jointly countering challenges and threats in the Eurasian space," the Russian leader said. The Russian and Kyrgyz sides signed earlier on Thursday as part of Putin’s visit to Bishkek a protocol on making amendments and addenda to the 2012 agreement on the terms and the status of the stationing of Russia’s military base in Kyrgyzstan. As Kremlin Aide Yuri Ushakov said on Wednesday, the protocol specifies some provisions that will benefit the real functioning of the Russian military base in Kyrgyzstan. Under the draft protocol posted on the Russian government’s legal information web portal, Russia will slightly increase the area of lands it holds on lease for its military facilities almost by 60 hectares and the lease cost will rise proportionally by $291,500 to almost $4.8 million a year. The agreement will also define such notions as "an unmanned aerial vehicle" and "an unmanned aviation system" and will include some other amendments. The Kant airbase was set up at the request of the Kyrgyz authorities. The airbase was opened on October 23, 2003. In 2012, Russia and Kyrgyzstan signed an agreement in Bishkek on the integrated Russian military base on the territory of the republic. It comprised the airbase in Kant, the Russian Navy’s long-distance communications center in Kara-Balt, the anti-submarine weapon testing base in Karakol near Lake Issyk-Kul and the autonomous seismic station in Mailuu-Suu. The agreement on the military base is valid for 15 years and can be automatically prolonged for subsequent five-year periods. Russian servicemen in Kyrgyzstan are equated to the diplomatic staff and enjoy the inviolability status.